As if to prove the old adage that there is nothing new under the sun I recently came across this lovely clip in the Pathe News archive. "Berchtesgaden, Germany. 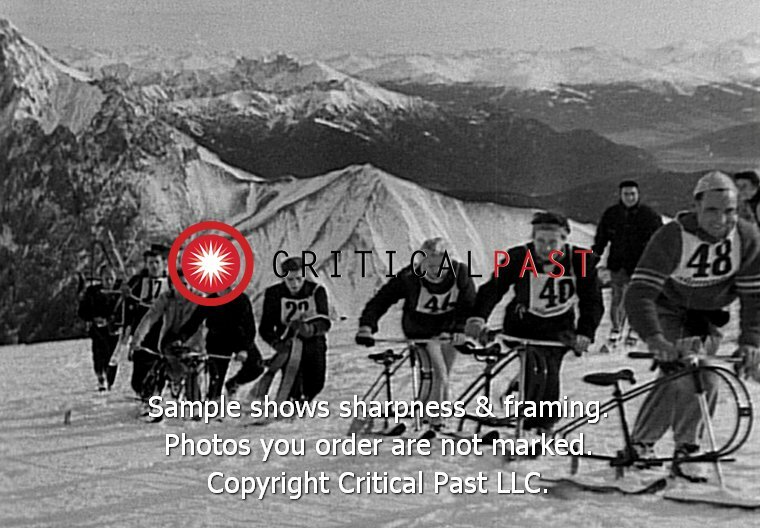 MS Various pans with ski-bobbers as they race downhill on the first artificially frozen track in the world during the German Ski-Bob Championships. (Two crash on hillside). The Swiss silver medal winner at Grenoble, Christa Schmuck, wins the championships. CU New German champion, Leonhard Nagenrauft being congratulated. Note: Date on original record: 27/01/1969.."
"New ski thrill, the ski-bob makes its debut during a skiing competition on snowy mountains of Bavarian Zugspitze in Germany. Skiers ride ski-bobs and start a race. Few skiers crumble in between the race. Spectators watch the race with excitement. A woman skier laughs during the event. The winner of Ski-Bob race crosses the finish line and crumbles on snow."